Prevention is always less expensive than cure. But if you need treatment and you have insurance, you don't have to take "no" for an answer. 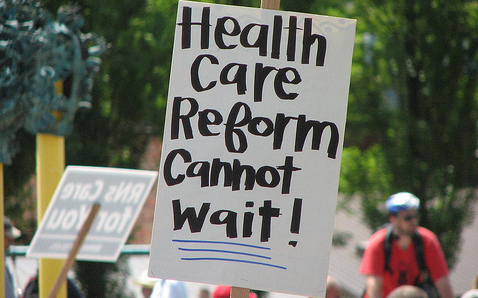 Americans hold strong and mostly negative opinions of their prospects for national health care reform. If people from the government aren't going to come and help, what can individuals do to improve their health regardless? The most important thing anyone can do as the foundation of personal healthcare reform is very simple: Don't wait for your doctor to tell you that you need treatment. When people can't afford health insurance and can't afford to pay the $200 to $1000 a quarterly checkup can cost, they tend to put off trips to the doctor until they become absolutely necessary. In the United States today, some people neglect taking care of their cholesterol and high blood pressure until they have a heart attack. They neglect taking care of their blood sugar levels until they suddenly go blind and have to be admitted to the ER for emergency rehydration. While it is entirely understandable that people don't want to shell out the equivalent of the rent or mortgage payment every three months, or, if you are between the ages of 55 and 65, the equivalent of the rent or mortgage payment every month for health care, in the long run it's a lot more affordable to take care of warning signs before they become full-blown symptoms. Prevention is always better than treatment. Here are some low-cost and no-cost actions you can take to prevent medical catastrophes. Take care of high blood pressure. Pharmacies usually have blood pressure meters you can use for free and many medications are available for just $4 a month even if you don't have insurance. Keeping blood pressure in control can save future catastrophic expense of heart attacks, strokes, blindness, and kidney disease. See your dentist for cleanings at least every year. Inflammation generated by the germs that cause gingivitis can also cause heart disease. Getting your teeth cleaned is an easy way to help protect your heart health. Get your blood sugar checked after a meal, not just when you are fasting. During the early stages of type 2 diabetes, the pancreas still has the ability to get blood sugar levels back down to normal overnight but not after meals. High blood sugar levels 2 hours after eating are an important early warning signal of diabetes. If the provider of free blood sugar testing gives hassles you about having eaten, just don't tell them! Treat heartburn by eating smaller meals rather than by taking calcium- and aluminum-based antacids. You'll absorb more of the minerals from your food that are needed by your bones. It won't be easy. You may have to try several times. But when you finally quit smoking you may have enough money left over for health insurance and even a little discretionary spending. Don't reach for a pill every time you feel a symptom. That also applies to nutritional supplements! Make sure you get all the nutrients you need even if you feel well. But make a practice of preventing and solving health problems by what you do, not what you take. This means washing your hands more often to prevent colds and flu, wearing sunglasses to prevent eye problems, using sunscreen to prevent skin cancer, and many other commonsense habits of good health. Smoking cessation, however, is the most important thing anyone can do for long-term good health. Perianal cyst/ abscess, will it go away on its own? What is a benefit of health insurance? Why is a health insurance plan so expensive?